Tompkins VIST Bank and Boyertown Area Multi Service staff and members highlight the bank’s donation. BAM won the funds by popular vote on the bank’s Facebook Community Minute Challenge. 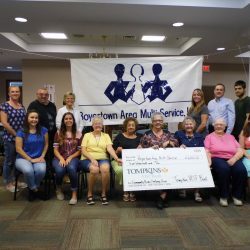 Wyomissing, PA, – The public has spoken: Boyertown Area Multi-Service (BAMS) deserves a $2,000 donation from Tompkins VIST Bank for creating the best one-minute video explaining how it would use the funds to further its mission. That was the decision of visitors to the bank’s Facebook page who participated in the Community Minute Challenge. The bank launched the contest in late summer asking a handful of organizations to create a one-minute video explaining their purpose and how they would use the funds to enhance their services. The bank then posted the videos on Facebook and invited the public to vote on their favorite. The winner would receive $2,000. BAMS competed against Berks Encore, the Children’s Home of Reading, Grace Neighborhood Development Corporation and CORA Services, both in Philadelphia, and the Schuylkill YMCA. BAMS’s winning video is available here. Tompkins VIST Bank Marketing Officer Ann Fioravanti said the contest drew more than 12,000 visits and 3,000 votes to the bank’s Facebook page. “We were pleased to be able to reward the winner, but also to use social media to highlight the contributions of the other organizations to their communities,” she said. Executive Director of BAMS stated that we are a social service agency dedicated to meeting needs and improving the lives of people in the Boyertown School District Area and surrounding communities of Amity, District, Hereford, Pike and Oley townships. Our mission of is to provide resources and services to meet unfulfilled human and community needs in the greater Boyertown area. We are here to support this community, its people, and their health and financial needs.